“Conserve till the last reserve” is the motto of the Department of Conservative Dentistry and Endodontics. The primary goal of the department is the diagnosis, prevention and treatment of defects of the teeth to bring the tooth/teeth to proper form, function, aesthetics and occlusal stability. Majority of the patients problems are treated in this department such as dental caries, which comprises of more than 80% of the dental diseases. Besides this, we also cater treatment of traumatic injuries to teeth, cosmetic correction, root canal treatment etc. The department trains undergraduate students in the specialty. The undergraduate students are trained to treat dental caries, other defects with suitable restorative material and root canal treatment. The postgraduate students are trained for comprehensive clinical care procedures like direct and indirect esthetic restorations, bleaching, veneers, and crowns to meet patients’ cosmetic demand. They are also trained in Root canal treatment, regenerative procedures, endodontic surgeries, and micro endodontics to relieve pain and elimination of infection from the teeth. The department is equipped with state of the art equipment like digital radiography, endodontic microscope, bleaching units and materials to provide excellent service to patients. The department treats on an average of 30,000 to 35,000 patients annually. The department is endowed with dedicated teachers, who are actively involved in teaching, research, clinical programme. CDE programmes are routinely conducted and attended by the faculty and students to enhance and enrich their knowledge. To establish a center of excellence in Education, Patient Care, Research and overall development so that students are well equipped to face the challenging world. State of the art dental setup with innovative dental education. To improve oral health of the community by rendering a high degree of patient care and services. In the past two decades there have been remarkable advancements in the dental field, be it in the bio-material or the technique of placements of these materials or in the equipment. The staff members in the department strive hard to make both undergraduate and postgraduate students to be aware of recently available materials by exposing them to handle these materials and equipment in their day to day clinical practice. The experience teaching faculty tries to use innovative Teaching-learning methodologies and integrate the knowledge with the clinical practice. 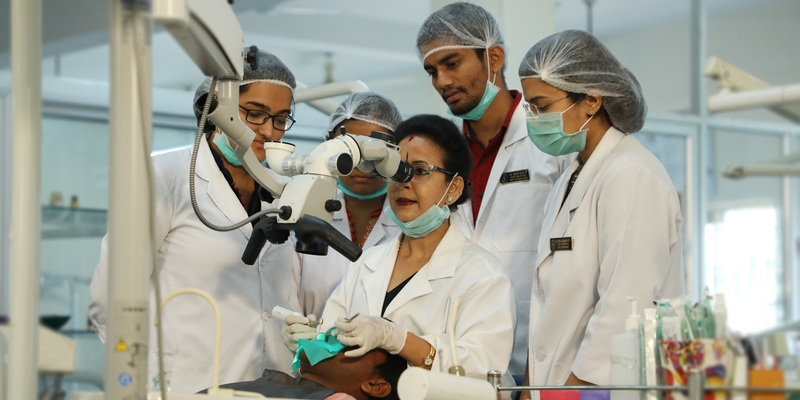 We at Krishnadevaraya College of dental sciences and hospital, Department of Conservative Dentistry and Endodontics believe that regular CDE programs have been very useful inputs in enhancing the knowledge and clinical skills necessary for professional advancements; in addition, it provides considerable confidence in the student mindset. The atmosphere in the department provides a sense of fulfillment in providing elements of excel in a procedure that reflect clinical skills and scientific advancements that leads to professional advancements, which has made to bag several awards and ranks in the university. Besides curricular activities, the students are encouraged to participate in full heartedly in all sports and in other co-curricular activities as we believe participation is mandatory for the overall growth of an individual. I invite all to see to believe and feel to believe the unique experience of your stay with KCDS family. Evalution of sealer penetration depth of MTA Fillapex and AH Plus in Er:YAG Laser treated canals. Accuracy between Root zx mini Vs Propex pixi -Invivo study. Influence of kinematics on apical debris extrusion. Effect of Benzalkonium chloride on addition to AH Plus & Mineral trioxide aggregate Fillapex Sealer on the physical properties. Effect of two different desensitisers on the shear bond strength of two different self -etching bonding agents. Analysis of pH and calcium ion release from zinc oxide modified MTA with different powder liquid ratios. Effect of Potassium Iodide (KI) on micro leakage of Silver Diamine Fluoride (SDF) pre-treated Class V cavities restored with composite resin – an invitro study.